Something smaller than a dime could make you sick here in Southwest Florida: ticks. A new vaccine could prevent you from getting Lyme Disease. Richard Naus said he was unaware he had Lyme Disease. Naus was diagnosed with it years ago, after his wife found the signature bullseye pattern on his back. The CDC says as many as 300,000 are likely to get the disease every year, all thanks to the deer tick. 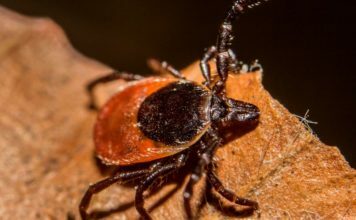 “The CDC actually issued a warning saying diseases caused by tick bites, mosquito bites and fleas have more than tripled from 2004-2016,” said physicians assistant Venessa Heath. Heath is a physicians assistant with Med Express, and has seen plenty of issues thanks to those tick bites. Not all of them result in Lyme Disease, but she still says you need to watch out. “Unless the weather drops below 32 degrees, the likelihood of ticks being there is still real,” Heath said. One way you can protect yourself is by wearing light-colored clothing. You can also tuck your pants into your socks. When going into the brush, the ticks have no way of getting up into your pants and giving you Lyme Disease. “If you do find a tick on your skin, it’s recommended that you come in and have a healthcare professional remove it for you,” Heath said. The first human trial for a vaccine to protect against Lyme Disease just wrapped up in France. The drug manufacturer, Valneva, said the vaccine is 96 percent effective and available in the U.S.
Something Naus hopes will help people like him. Because until a vaccine is ready to go, everyone enjoying the great outdoors is at risk. The CDC says another way to protect yourself is to put your clothes in the dryer for 10 minutes on high heat after spending time outdoors. That should kill any ticks clinging to your clothes.